Lori graduated from Gonzaga University with a BS in Biology and then went to the Intercollegiate Center for Nursing Education for her BSN. She worked as a Med/Surg nurse for several years at Georgetown University Hospital in DC and at St. Vincent’s in Portland, Or. Lori worked as a public health nurse in Wolf Point, Montana and then took some time off to raise her five children. When her youngest was in kindergarten, Lori decided to go back to school and get her school nurse certification. She worked as a school nurse for 18 years. She earned a Masters in Nursing from Regis and became a nursing instructor. 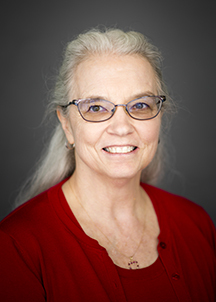 Lori has taught clinical at Spokane Community College for three years and at the College of Nursing since 2012. Currently Lori teaches a Child Health Clinical, an Introduction to Nursing Practice Clinical, and the School Nurse Initial Certification Course. She has a strong interest in school nursing and child health and enjoys working with first semester nursing students to help give them a strong foundation in nursing values and skills. Cardiovascular Conditions Chapter in “Individualized Healthcare Plans for the School Nurse – Second Edition” to be released by Sunshine Press March 2017.